Governor Snyder will travel to Asia late next month. 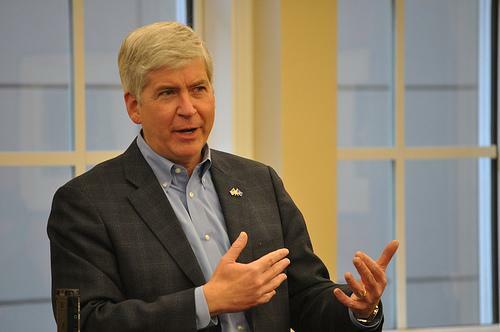 “Snyder's office said Monday the Republican governor is expected to arrive in Tokyo on Sept. 25. The trip is expected to include stops in Japan, China and South Korea. Snyder is scheduled to return to Michigan on Oct. 1. The international trade trip would be Snyder's first as governor,” the Associated Press reports. Snyder is to be accompanied by MEDC CEO Mike Finney, Agriculture Director Keith Creagh and four economic development officials, MEDC spokesman Mike Shore said. He could not provide a cost estimate for the trip, but said no general fund money would be used. Airfare will be paid by the Michigan Economic Development Foundation, supported by donations, and other costs will be paid by the group's corporate funds, most of which come from a tax on American Indian casinos, he said. Snyder is scheduled to arrive in Tokyo on Sept. 25 for the 43rd annual joint meeting of the Midwest U.S.-Japan Association and the Japan-Midwest U.S. Association. He also plans to meet with Michigan-based companies in Beijing, attend trade-related functions in Shanghai and travel to Seoul before leaving for home on Oct. 1.